Each Imperial II lamp head provides a stunning 300 lumens of bright-white light, making the series ideal for residential and commercial applications. Solar lamp posts with one, two, or three lamp heads offer full-sized outdoor lighting solutions for home owners and businesses. They can be installed anywhere with no pre-existing hardware or utility service required. For anyone looking to upgrade an existing lamp post with an energy-saving, money-saving solar lamp head, we offer solar light fixtures with different post-mounting styles. 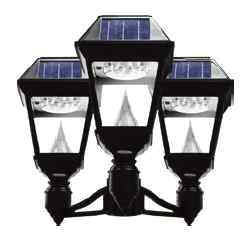 We also have a wide range of wall-mounted solar light fixtures. All Gama Sonic lamp posts and light fixtures are engineered for dusk-to-dawn performance and include our patented cone-reflector technology to help cast light in all directions. The GS-97NT is available with three different pole size options which include concrete mounting bolts for installation.